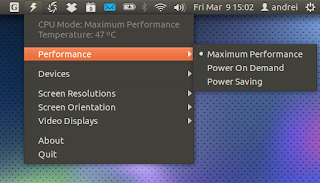 Jupiter is an applet designed to improve laptops / netbooks battery life. It can be used to switch between maximum, high performance and power saving modes, change the screen resolution and orientation, enable or disable bluetooth, touchpad, WiFi (if available) and so on. If you own an Asus EeePC netbook, there's also a separate package that adds support for Asus Super Hybrid Engine (SHE) as well as some other EeePC tweaks. Jupiter applet is written in Mono and it comes with a systray icon only, so to use it in Ubuntu you have to whitelist Jupiter to get it to work. Jorge Luis Betancourt Gonzalez has re-written Jupiter applet in Python (there are no more Mono dependencies) and added Ubuntu appindicator support, so there's no need to whitelist the systray anymore. The new Jupiter applet written in Python is called pyJupiter. This isn't an official Jupiter port to Python, though Fewt, the Jupiter developer, is considering switching Jupiter to Python. Update: Jupiter has officially switched to Python so there's no need to use pyJupiter anymore. Just install Jupiter as usual. 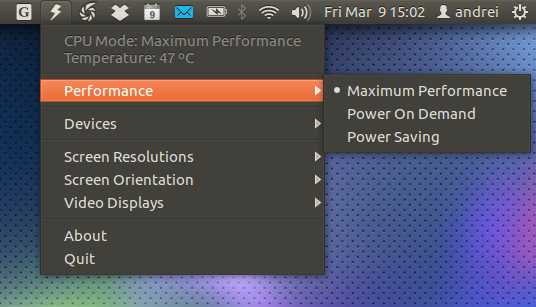 For now, the Jupiter indicator only comes with Ubuntu mono light (for dark panels) icons but if you want to use it with a light panel, you can download Ubuntu mono dark Jupiter icons from HERE (to use them, copy the icons to the /usr/share/pixmaps folder). Update: Jupiter has officially switched to Python so there's no need to use pyJupiter anymore. Just install Jupiter as usual. Note: Installing pyJupiter will remove Jupiter, so you can't have both in the same time. Many thanks to Jorge Luis Betancourt Gonzalez and to Ernesto Acosta from desdelinux.net!